In this morning's websurf, I landed on, Why You Learn More Effectively by Writing Than Typing. The act of writing helps you clarify your thoughts, remember things better, and reach your goals more surely. Here's a look at the science and psychology behind writing, and why the pen may be mightier than the keyboard. Zentangle is all about putting pen to paper, so I wanted to read this. I encourage you to read it, too. Today there are fewer and fewer reasons to put pen to paper. So when you do put pen to paper, it has a greater impact. Putting pen to paper creates an intimate closed loop as your eyes focus on your pen and its ink. This experience is primal and immediate. In other systems that loop is broken. If your fingers are on a keyboard, mouse or tablet, your eyes are usually on a screen. If you're watching your fingers type (even on a typewriter), the result is also elsewhere. Even if you are using a stylus on a touch screen there is a technical gap between stylus and screen image. As your movements are translated through computer processors and software into pixels on your display, your stylus never really "touches" your creation. My takeaway from this article (not surprisingly) is that the magic of writing longhand is in what happens because you put pen to paper, not just because you are writing. 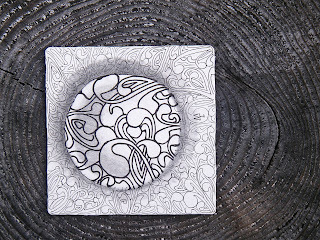 This article reinforces how valuable the practice of Zentangle's method is. The benefits of putting pen to paper don't depend on how good you are, they depend on doing it. Zentangle's method provides the structure and freedom for you to enjoy this process without expectations or self-criticism. 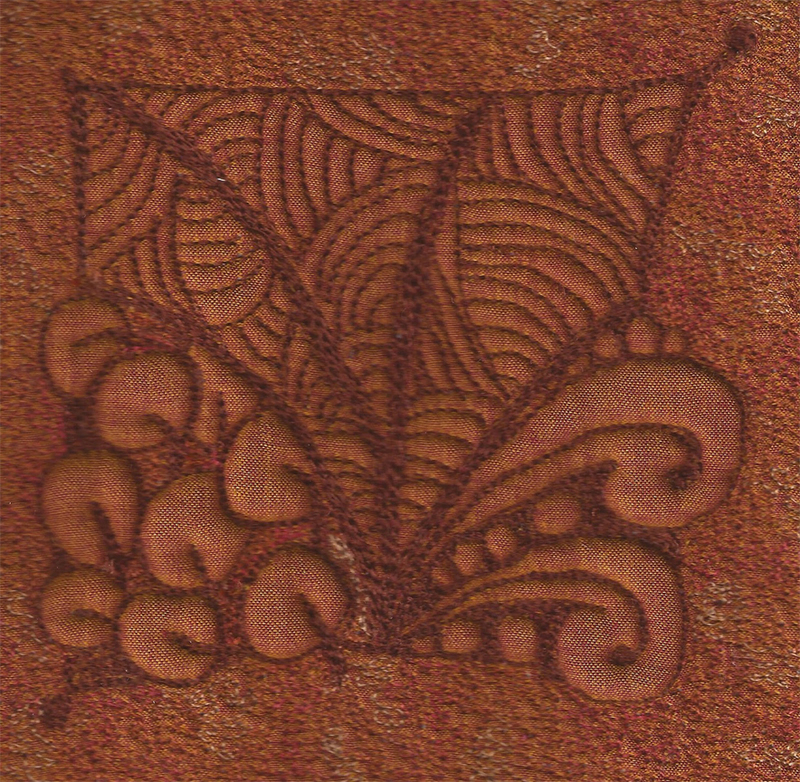 I think that's an important and easily overlooked reason for the benefits and enjoyment that Zentangle provides. 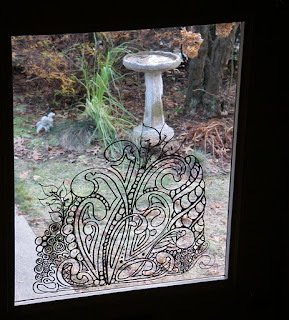 As you enjoy creating something in a Zentangle way, fresh and creative ideas have a way of popping up. Keep another sheet of paper handy to capture those idea jewels! Oh yes, to answer our puzzle blog . . . "The envelope please!" 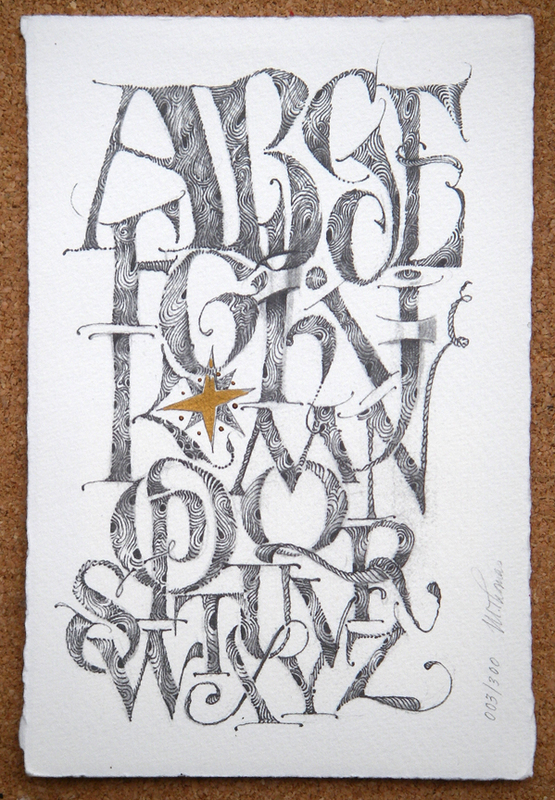 Here's a larger image of a Puzzle Christmas Card that we described in this newsletter. Why is this a Christmas card?
. 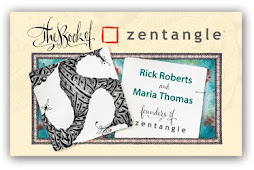 . . We are so grateful that you are part of our Zentangle community. Thank you for your purchases. Thank you for sharing your Zentangle enthusiasm and creations with us and with others. And for all of you whom we've had the pleasure to meet, thank you for your friendship. We look forward to sharing a wonderful 2012 with you all! 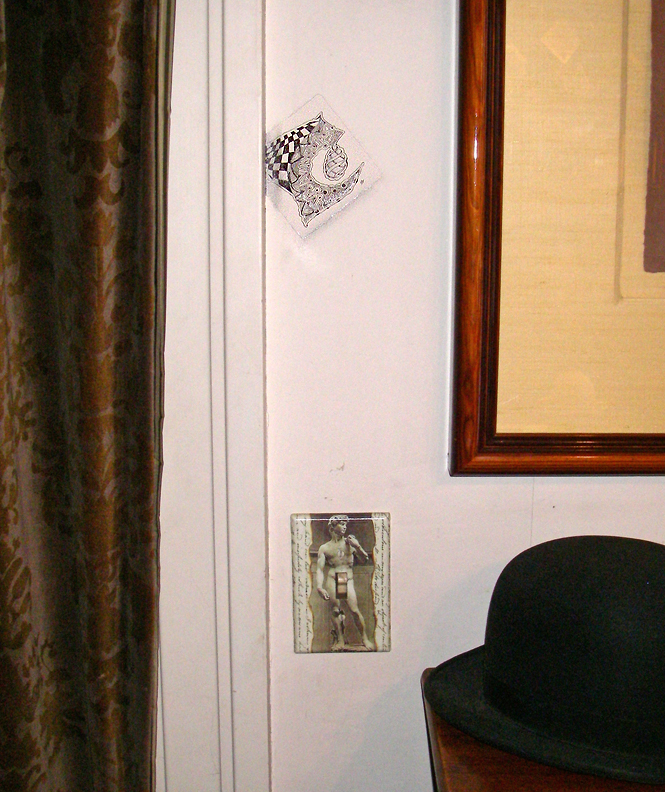 Click image for clearer view of puzzle. It's nice to be reminded of the joy in simplicity. Thanks to Jeannie Mahood, CZT, we received this elegant reminder. 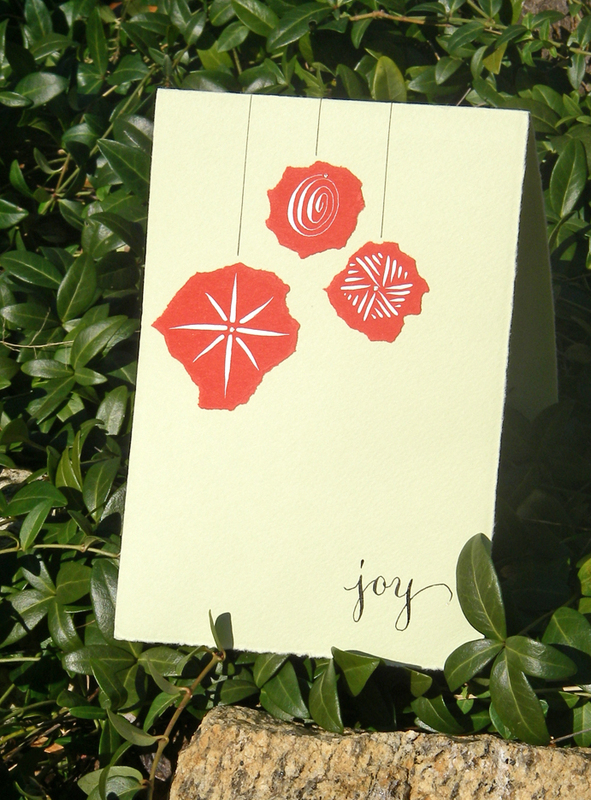 Wishing you all the simple joys of this season. Click image to see larger view of pointed-pen tangling of swarm and other tangles. You may have heard about the "Elf on the Shelf" tradition that's all the rage with kids this holiday season. It is a book and a small elf toy that you put in a different place each night for kids to find in the morning. Sounds like fun. But those of you who don't have kids (or if you want to play with this idea year 'round) . . . here's something else you can do. For many years my lot in life has been to tangle Zentangle art and tiles in really unorthodox places. I have tangled on floors, pillows, lamps, napkins, clothing, shoes, purses, porch pillars, windows, eggs, dishes, kitchen items, lamp shades, vases, seat cushions, bathroom walls, mat boards, bulletin boards, stationery, paintings, finger nails, tattoos (fake and real! 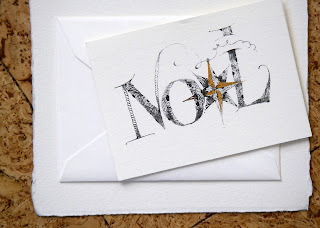 ), Christmas cards, Christmas ornaments, mobiles, tongue depressors, ties, pies, table tops, sidewalks, beach sand, clip boards, Easter eggs, body art, motorcycle helmets, name tags, a car(! ), a podium, napkins, place cards, bowling pins, flags, murals, bug illustrations, teapots, my medicine cabinet, frames, illuminated letters, a footstool and bed posts. I have covered spots on clothing, hidden holes in plaster walls and repaired a dent in our car's fender. And the list goes on, I am sure. Is there any other art form so versatile? So, intrepid Tanglers, here is my challenge to you . 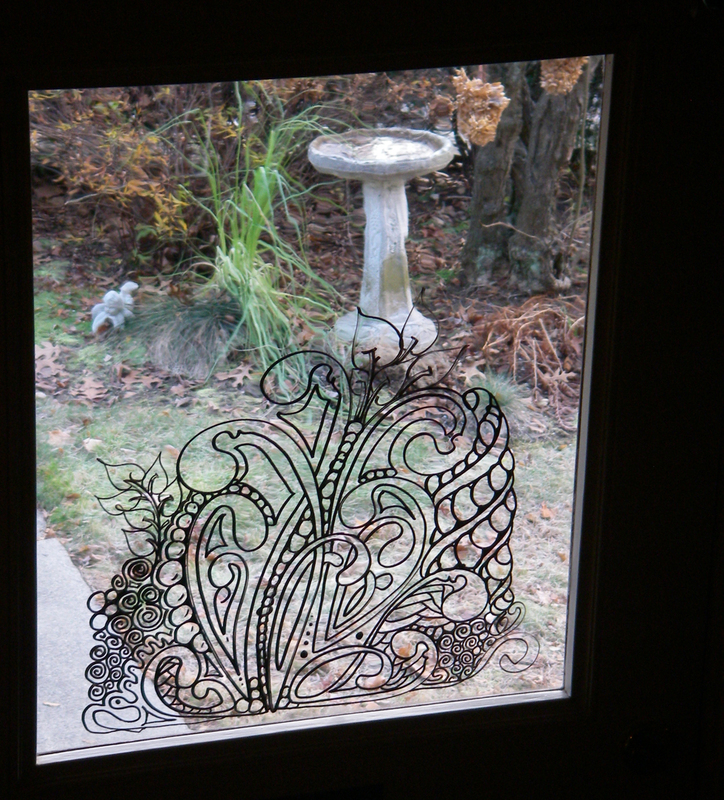 . . draw a Zentangle somewhere that challenges your sense of "Oh, my goodness, I couldn't possibly do that!" I have to say when you do something that is against the rules . . . sometimes it just feels good to be just a little "naughty AND nice"! 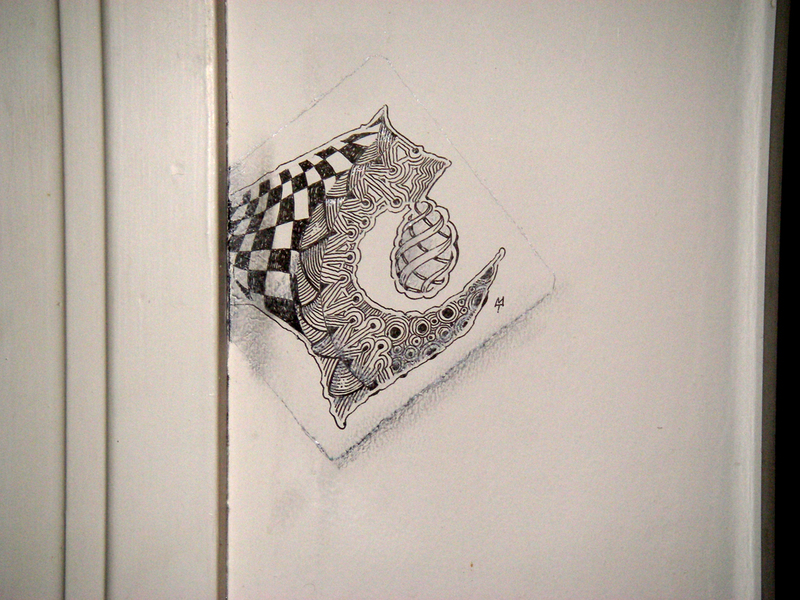 Trace a Zentangle tile on your wall in pencil. It could be a white wall but that's not necessary. Trace it so that a little corner of it seems tucked into the door frame or wall moulding. Use your 01 Pigma™ micron to tangle and a HARD pencil to shade (so it won't smudge off so easily). Shade a bit around the tile itself on 2 sides (right and bottom, usually), so that it appears to be a real tile. Don't do this if you are apt to wash your walls (I don't). But I gotta say, I have some that have been there for many years and still to this day, they bring a smile to me each time I walk by . . .like "you go girl" type stuff. Sometimes I'll draw a Zentangle tile somewhere in the house and wait to see how long it takes for someone to discover it! (My idea of a good time! LOL.) And, it doesn't cost anything, because most of us already have the supplies on the shelf. Have yourself a Merry little Christmas . . . or whatever you and your family celebrate. And bring a simple smile to yourself and others . . . maybe everyday. 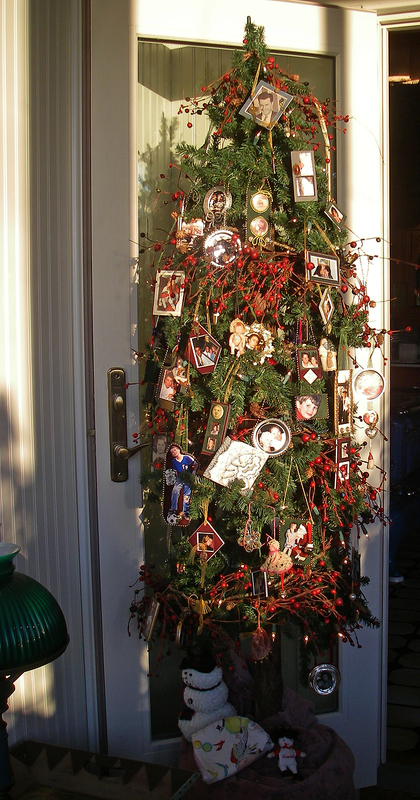 Appropriately, this tree is decorated with pictures of our family and odd trinkets with treasured family memories. 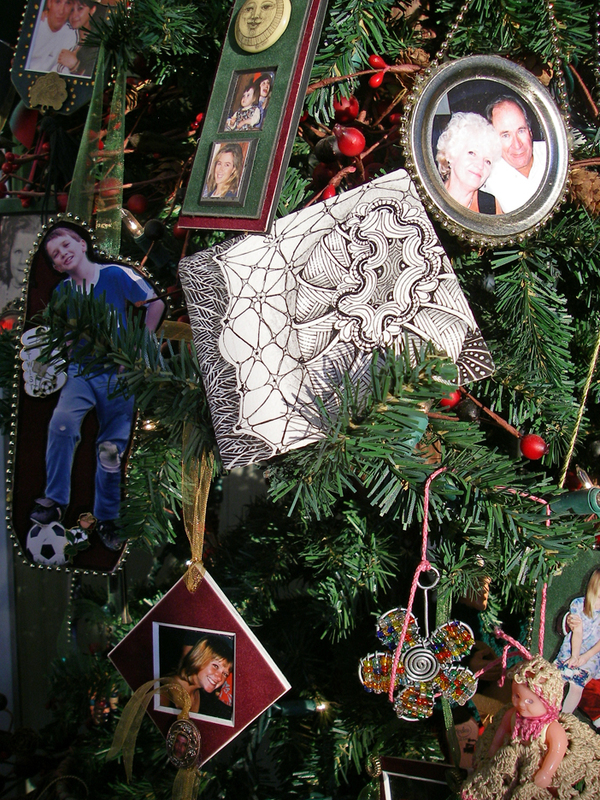 A Zentangle tile is right at home on this tree. 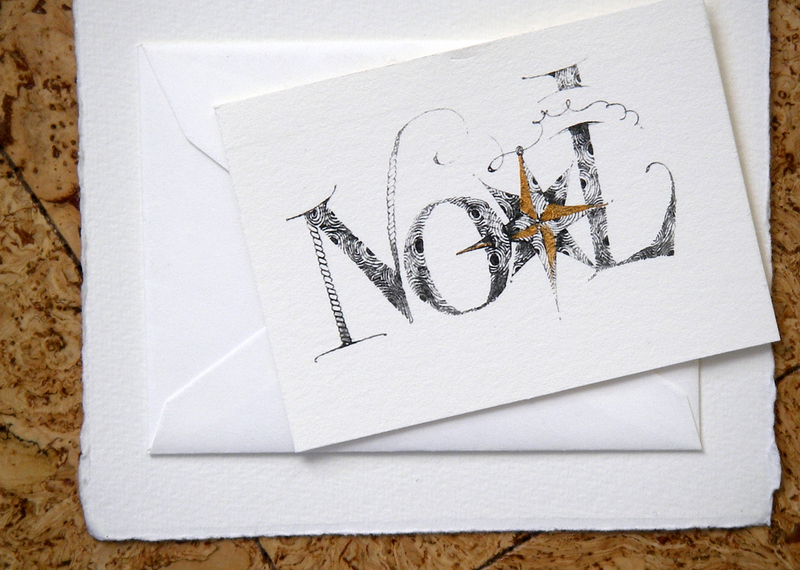 It reminds us of all the wonderful new friendships that Zentangle has brought to us. Words cannot describe how lucky we feel. 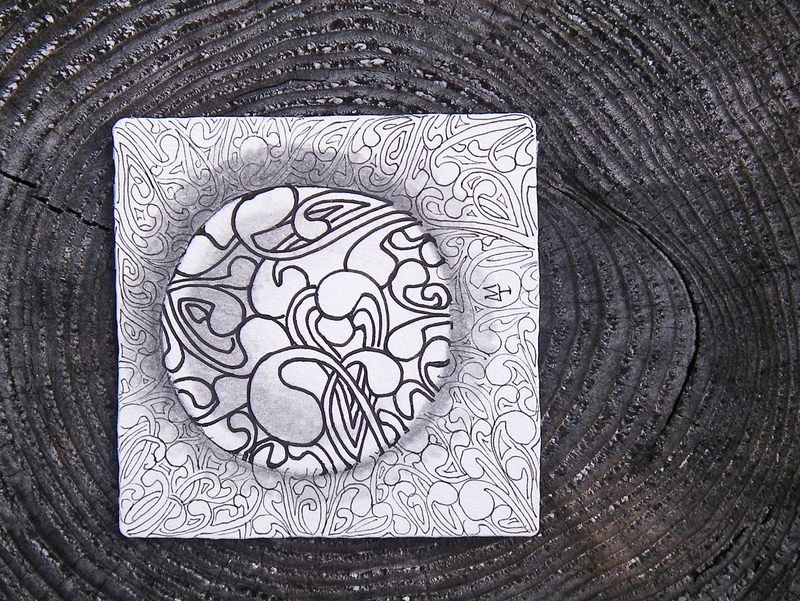 Thank you all for enjoying this wonderful unfolding Zentangle adventure with us! Elaine blogs the steps she took to make that translation with some great pictures from her quilt studio in this blog entry. This is Elaine's second blog entry and we've added her Sew Tangled blog to our "Links" section. 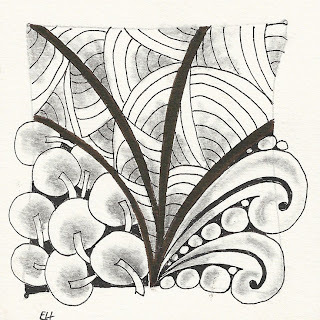 Speaking of "Links," over the past few weeks and months we've added many new links to Zentangle related blogs. Small things, done consistently, in strategic places, create major impact. What are [your] top 'small things' right now? 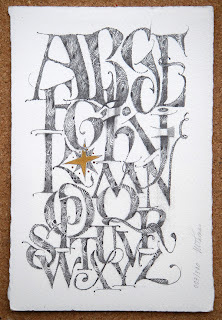 When I (Rick) read those quotes, it was natural for me to think of individual strokes in a Zentangle creation. Each stroke is a small thing. 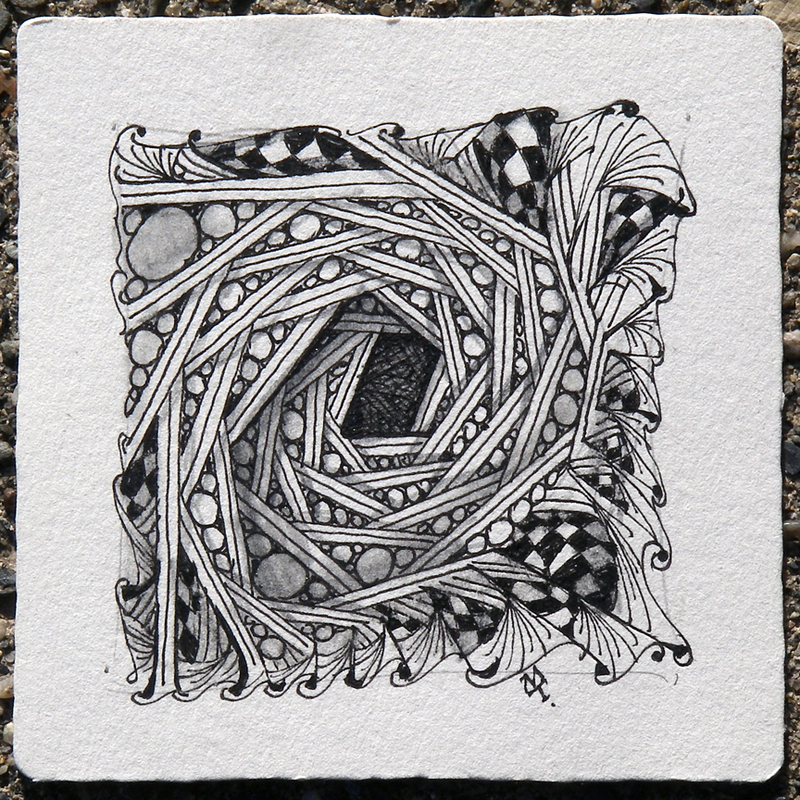 Each Zentangle creation is made up of small individual strokes. Then I thought of our Zentangle slogan . . .
. . . and I realized that not only is anything possible, one stroke at a time, but that most things are ONLY possible, one stroke at a time . . . at least for me. My activities are more successful and certainly more mindful and enjoyable when I am able to do them one at a time. 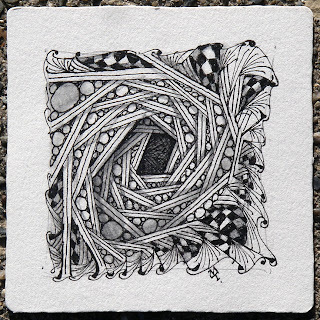 However, there is a Zentangle paradox at work here, too: When you can't concentrate at all, creating something in a Zentangle way can help your concentration. Some weeks after after Maria and I had given a Zentangle workshop at our local book store, a woman stopped us on the street. She said she regularly went to church with her two sons. She also said she never remembered the sermon, but continued to go for her sons' benefit. One Sunday she was sitting in church and thought to herself, "I'm not going to remember anything so I might as well tangle!" So she took out a Zentangle tile, a pencil and a pen and tangled during the sermon. "I remembered everything he said! . . . for the first time ever!" So, however small a thing you may be doing (or thinking, or saying, or planning, or . 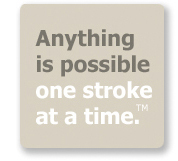 . .), appreciate and savor it, "one stroke at a time." And if the tumbling tumult of (seemingly) big things becomes too distracting, grab your Zentangle tiles and tools and treat yourself to a Zentangle moment. Click image for larger view of small strokes. We received this beautiful image . . . The holidays are here in full swing, eh? I've always integrated my artwork into my Christmas decorations. When we unpack our decorations every year there are the kids art projects -- and mom's. LOL This year I came up with a simple holiday project that I posted on my blog and the teachers forum and I've gotten a lot of response from it. Since these are so simple I thought maybe you would want to share the how-to on your blog or in the newsletter. 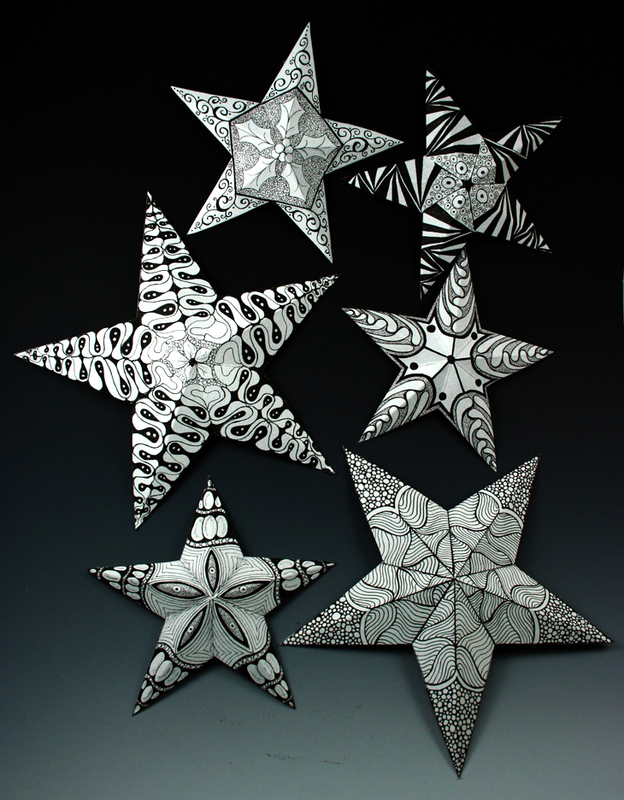 The stars are just a fun way to work Zentangle into the holiday festivities. So if you are looking for ideas, please feel free to use this. Thank you so much for sharing that! Please take a look at Susan's blog post for her simple instructions on how to create amazing 3-dimensional stars from a single sheet of paper. Click image to see bigger stars! Laura Harms' current (50th!) challenge is to "Bigify!" 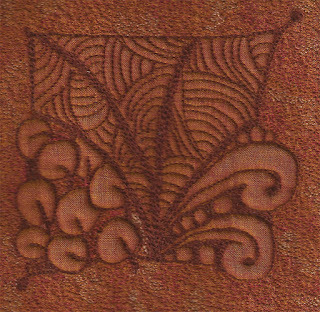 Here Maria uses Zentangle's embellishment technique of "dewdrop" on mooka. 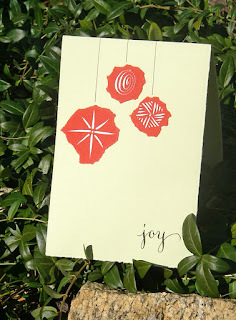 See other examples of this challenge at Laura Harms' (CZT) blog. Click image for larger view of "dewdrop" on mooka (on a hemlock stump). We had friends over for supper last night. Maria tangled our front door glass as a special welcome. Using mooka as a primary tangle, it didn't take long to do because mooka is a great tangle for covering large areas quickly. This is old glass. Notice how it distorts the birdbath in the background. This glass also distorts the light coming in as you can see in this blog entry. And speaking of "Welcoming Friends," we look forward to doing just that at our February Seminar (which is filling quickly). Click image for closer view of tangled glass.